difficult to see the colours used but the paper matting the photo is actually red, honest and it has triangles on it which you can probably just make out! I have lots of layers using up lots of scrap bits of paper and only used a whole 12 x 12 for the background. I had a couple of badges that seemed to fit the theme of the photo one was advertising a drink but I blacked out the wording under 'get lost' and the other badge simply says 'naughty boy'! Lovely Layout Furrypig, thanks for entering our Scrapology challenge. 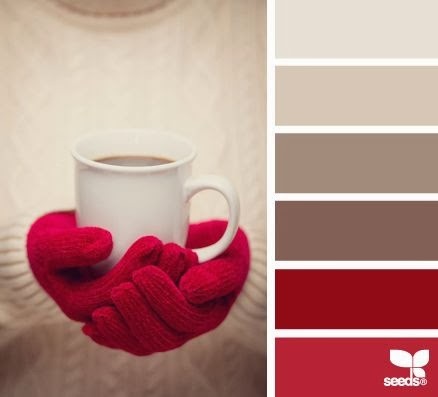 Great layout, love the idea of combining the design seeds colours with it. That misting is great - just a suggestion of a mud splatter! 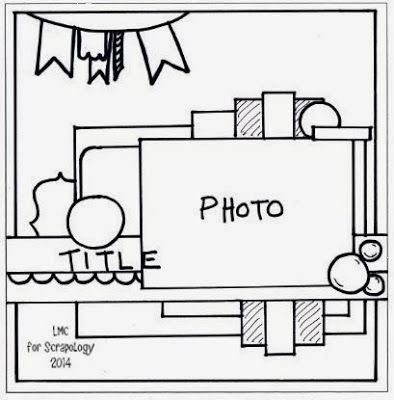 You have really fulfilled all the criteria here for your sketch and challenge - lovely! 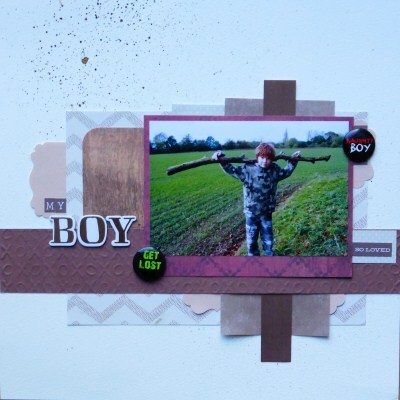 Great layout - I like how you've used up some scraps with the fabulous layering. Lovely. Isn't it fun using up scraps for a page? What is it with boys and sticks? Lots of lovely layers. 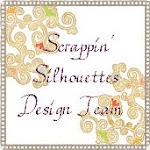 Thanks for entering your layout in the Scrapology challenge. Good luck. Love the layers...and the 'mud' splatters! Oh that's lovely I love how you combined the challenges, I loved that Scrapology sketch - one of my favourites can't wait for the next one! What a super boy page - I love the badges. I cannot believe that you have a Christmas countdown on your blog Ruth!!! Love the page - the badges are great and that stick is just too funny!